My grandmother has trouble seeing, has arthritis, and has trouble keeping more than a few details in her head at any given time. We tried to teach her how to use the TV remote, and by mistake instead of pressing the up/down volume control, she hit the "media" button and all of a sudden a menu popped up on the TV, in relatively small print, asking which USB port she wanted to browse. (I guess this TV lets you watch pictures on USB thumb drives.) We had to take the remote away from her and spent another 5 minutes figuring out how to get the TV back to normal. Even the on/off button was problematic: although the TV turns off instantly, it takes a few seconds to turn on, with no obvious indication that anything has happened until the "VIZIO" logo pops up. After some time watching her frustration, I resolved to get a better remote control, one that wouldn't let her get the TV stuck in some weird mode that she couldn't get out of without having someone come to her rescue every time she pressed the wrong button. We tried it at the TV at their house (they also have a Vizio TV), and it looked ok. But then when we tried letting her use it, she had trouble again. This time, the TV wouldn't get stuck in the wrong mode, but the remote control did -- if you press DVD then it goes into DVD mode, and none of the buttons take effect, or if you press the "menu" button it gets stuck in another mode and flashes a red LED -- not returning to its normal mode until you press the TV button. And she got confused with the different placement for the channel and volume controls. We ended up taking the RCA remote back, and just telling her where the channel/volume controls and the on/off button were on her Vizio remote, and telling her repeatedly to NOT press any other buttons. So what does this have to do with embedded systems design? Any of you who are designing embedded systems have some kind of customer -- either yourself, or your friends and family, or your employer, or another company and its employees, or consumers. And unless that customer can use your device, the customer will not use your device -- perhaps this is an obvious statement, but it seems to have been overlooked by many manufacturers -- even if its technical specs are very good. You also cannot assume your device has any place of importance in your customers' lives. It will be competing for their attention, not just against other consumer electronic devices (the cell phone, the computer, the microwave, the radio, the television, the car, the DVD... the list goes on and on), but also against many other people and problems. The complexity of your device, if it relies on anything but an intuitive use, is a liability that can send it back to the retailer for a product return, or if not there, then in the back of a closet or storage shed, along with a latent story of frustration just waiting to be told, should the consumer be reminded of your brand. Now back to the television. Nearly everything else is there for some obscure setup or adjustment (tweaking the color/contrast, setting the time/language/etc.) or some odd special feature of the TV that you want to use (e.g. displaying photographs from a USB drive). So why are the buttons of the common features interspersed with all these other weird buttons? But now, having spent several frustrating hours with my grandmother while learning to use a TV, I have been jarred out of my comfort zone. 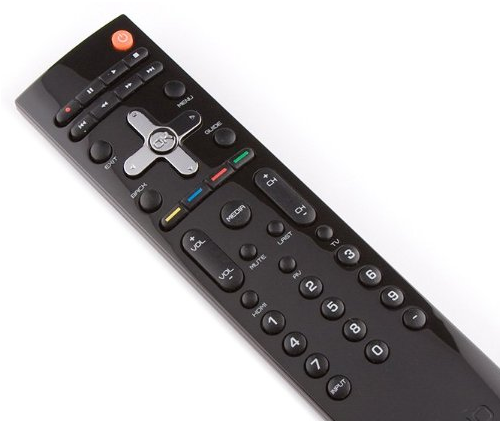 TVs should come with a full remote control, and a separate day-to-day remote control -- if you want to do something complicated, pull out the full remote control and do it, otherwise, keep it simple and have 7 or 8 buttons at most along with a number pad. Aside from small print, or odd layout of buttons, the biggest pitfall in a user interface for consumer electronics, in my opinion, is multiple modes of operation. This is when some or all of the buttons do different things depending on which mode the device is in. It's a way of saving the expense and room of more input devices -- digital wristwatches are the canonical example; with a clock/timer/stopwatch and 4 buttons, there's just not much you can do without those buttons each doing triple or quadruple duty. Good for manufacturers. 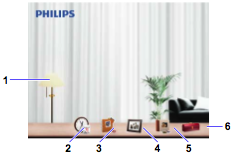 But a user of the device has to figure out which mode the device is in at any given time, and distinguish his/her mental map of how the device works in that mode, with the way it works in other modes. My goodness -- we paid for 800x600 screen real estate, and they're wasting 90% of it on a fake image of curtains!? This is horrible UI design. It doesn't match anything commonly used on PCs or cell phones, but is reminiscent of certain failed "easy-to-use" operating systems or interfaces from the 1990's (most notably Microsoft Bob). Anything else -- in the case of the Philips SPF3480, this includes features like showing a clock, copying pictures between internal memory and a memory card, "tagging" pictures, panning and zooming, selecting the transition effect when switching from one picture to another (fade/wipe/pixellated things) -- is fluff, in my opinion, and if not compartmentalized into a "more advanced" section of operation of the device, just serves to confuse the user. I found it too easy to accidentally display the clock, and too hard to get back from the clock to "normal" photograph operation. And if you turn the device off and on (or if you accidentally unplug it, or if there is a power outage), instead of resuming whatever it was doing, you get dumped into that main menu with the fake curtains in the background. So I hope that we can get it setup for my grandmother with pictures she likes, and that we can turn on the photo display and leave it there cycling through photographs, and the power doesn't go off in her building. Please do your prospective users a favor, and put some thought into making your device easy and intuitive to use. If it's a consumer device, the best test of it may be to bring it to a local senior center and see what trouble they have. Good points, and good to remember that none of us getting younger. I went through everything you have mentioned with my own mother. When we moved my mom out of her house, I was able to find a microwave oven with only a mechanical timer and cook/defrost switch...no button sequences to remember, no flashing "12:00" after a power outage. That oven is now sitting on my kitchen counter and still working fine after the second uP controlled microwave oven died.